There are a couple of popular times to start cleaning out your clothes closet. One being in the Spring, during an annual Spring clean up, and the other time being the first of the year when you may be feeling motivated for some fresh starts and organization. During these times, you may find that you have a few sweaters that are a little outdated, don’t fit quite right, or have aged to the point of being unacceptable to wear. If they are in no condition to be given to a charity, there is now no reason to just throw these sweaters out. You can use the good pieces for several different craft projects that will transform them into a beautiful and useful item. The following list of sweater crafts should inspire you to start cleaning out your closet and get crafting! 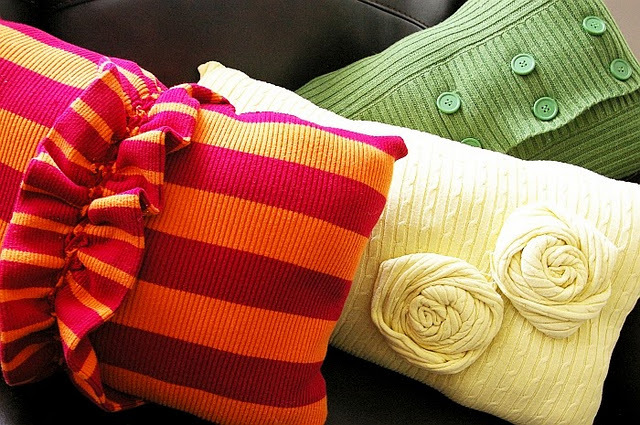 Pillows are an easy project to do and when done with a sweater provide an exceptionally soft and inviting accent to cuddle up to. You can find the tutorial for my pictured pillow here. 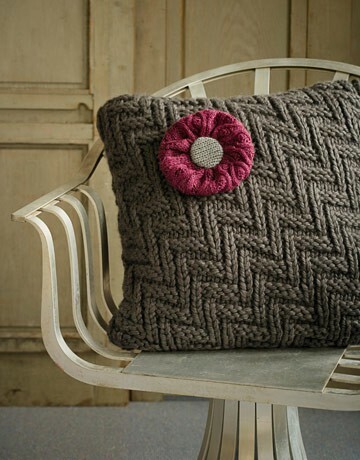 The added flower embellishment is a nice touch on this pillow by Country Living. Brassy Apple puts together a fun collection of colorful throw pillows. 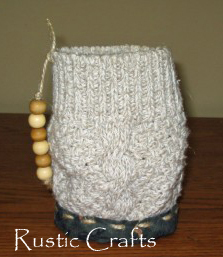 Use a sweater cuff to make a bottle sleeve! This size works great for a bottle or you can fold down the top to fit a smaller hot drink. 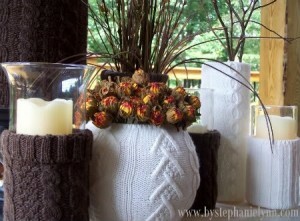 By Stephanie Lynn shows a fun way to warm up your vase and candle display for the Fall and Winter. For more Fall and Winter decor, this easy sweater pumpkin craft is a fun accent for the season. 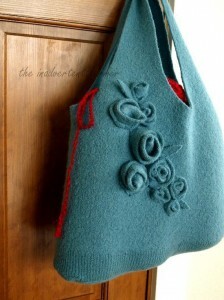 You can also turn a sweater into another fashion accessory like Sweet Grace did with this beautiful purse. Or…. 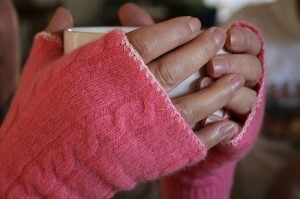 these fingerless gloves by Foothill Home Companion. 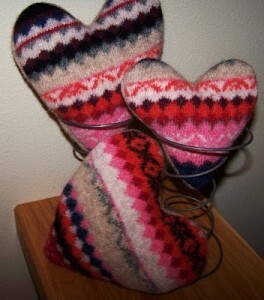 A perfect craft for Valentines Day are these warm and woolly hearts by Beyond The Picket Fence. And finally, I just love this rustic looking snowman by High Heels And A Hammer! 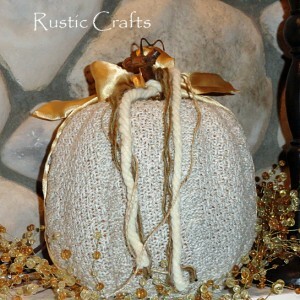 I may have to make a few of these to set around my house and cabin. 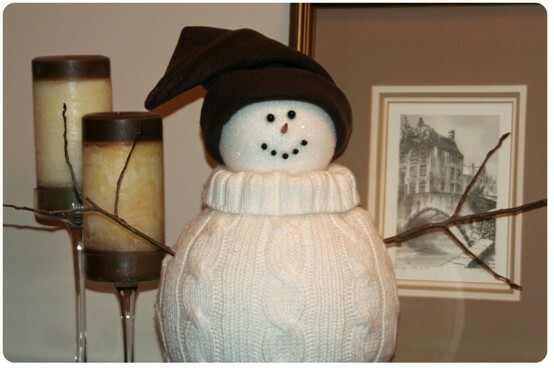 I do have a weakness for birds and snowmen! If you have any other great ideas for recycled sweater crafts, feel free to share your ideas in the comments section below. Now go see what gems you have hiding in your closet and get started with one of these fun crafts!